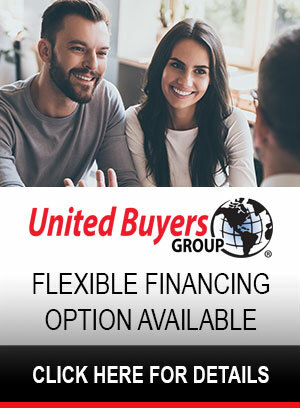 Residents in Jackson CA, Pine Grove, Pioneer, Wilseyville, Lockeford, Martell, Drytown , Sutter Creek, and the surrounding area in Amador & Calaveras Counties count on Sierra Hearth & Home for the top selection of wood, gas, and electric fireplaces, fireplace installations, and more. Modern fireplaces are engineered as a firebox enclosed within a steel cabinet. Air circulates within the body of the fireplace, transferring the heat to your room and keeping the outer wall relatively cool. The fireplace’s construction allows it to be installed close to the wood framing in new construction or remodeling. 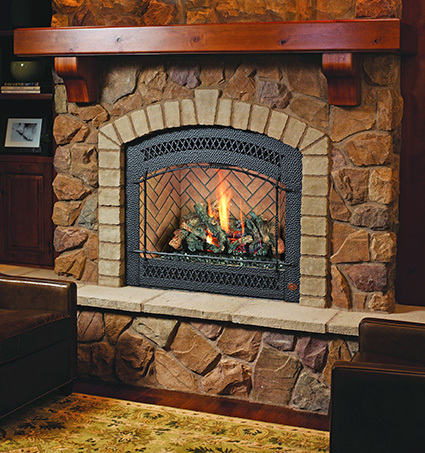 Compared to a traditional masonry fireplace, factory-built systems are surprisingly inexpensive to purchase and install. They use a safe, lightweight chimney and do not need the additional structural support required for a masonry chimney. They can be easily and safely installed in almost any room. You can finish your fireplace with a sleek, modern design or a rustic log mantle. The possibilities are endless. We all know what the perfect fireplace looks like – a beautiful construction of stone or brick, holding a big fire of fragrant, crackling logs. That’s still true but in today’s world fireplaces have really branched out. Sierra Hearth & Home offers you choices in fuels, styles and efficiency to truly make your fireplace the heart of your home. Zone heating (putting heat where you need it, when you need it), allows you to turn down the thermostat on your central heating system and save money on your energy bill. Traditional wood-burning fireplaces provide the ambiance of a roaring fire, but send most of their heat and all of the combustion by-products - almost half of your fuel - up the chimney. Sierra Hearth & Home sells manufactured EPA-certified fireplaces that capture those burnable byproducts and use a secondary burn process to burn them as well to give you a much more efficient fire. Because you burn more of the fuel you put in you use less wood, generate more heat, and greatly reduce the creosote that can build up in your chimney. This means a warmer home and a cleaner chimney for you and cleaner air for us all. 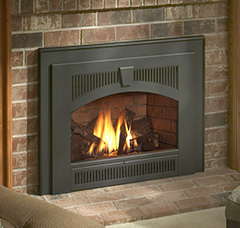 If you prefer the ease of using gas, we have a fireplace for you. A flick of a switch gives you a beautiful, realistic flame that can produce a generous amount of heat. Many look like the traditional, rustic fireplaces of old but the ultra-modern look is also popular. These offer a clean, simple face and glass or stones in place of the classic ceramic logs. Gas fireplaces are very clean and efficient, need a minimum of maintenance, and come with blowers to circulate the heat into your home. To simplify your life Sierra Hearth & Home carries a variety of thermostats and remote controls. And don’t worry about power outages. 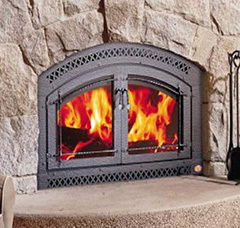 Gas fireplaces will still burn even without electricity so you’ll stay warm all winter long. 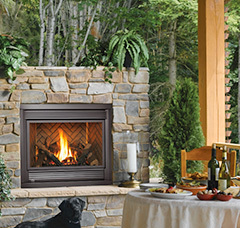 Outdoor fireplaces are an important part of many backyard remodeling projects. Available as wood or gas-burners they provide a focal point for a family gathering in the evening or for the outdoor get-together that’s the envy of all your friends. And yes, you can still toast the perfect marshmallow! Sierra Hearth & Home is a locally owned hearth retailer that is dedicated to bringing peace and warmth into your home. Our highly knowledgeable staff and factory trained and certified technicians will help you find the perfect fireplace, one that you and your family can enjoy for years to come.